Today, meet Captain Dalton stationed in the Philippines prior to the start of WWII. As this scene unfolds, Pearl Harbor has just been bombed and the Japanese have now turned their forces on the American military stationed in the Philippines. This is the very first time Captain Dalton has ever seen a battlefield. He has just fallen in love with a beautiful nurse...and all of the emotion and reality and fear has just crashed down at his feet. While Captain Dalton is purely a work of fiction spun up in the creative (scary) parts of my brain, General Wainwright was very much real. The account of him walking proudly across the parade ground even as bombs exploded around him, really did happen. Ole' Skinny, as his men called him, was a lesser known hero in the sagas of WWII and it's Pacific Theater. I include him throughout the novel. 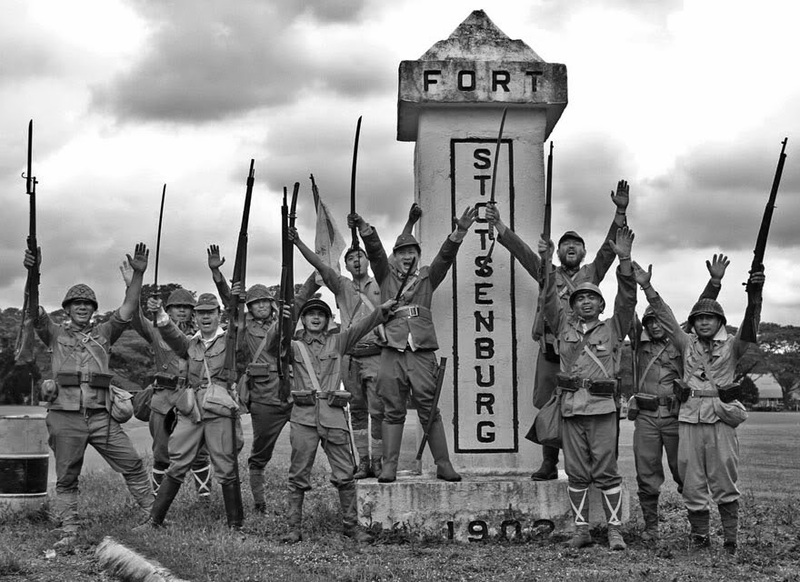 What Peter found when he brought the jeep to a stop at Fort Stotsenburg was the stuff war stories are made of. Japanese fighter planes were swooping off in the direction of Clark Air Field where P-40s were struggling to get off the ground and fight back. Bursts from antiaircraft fire filtered into puffs, never making it high enough to help ward off the attack. Men were swearing as they ran for the protection of foxholes, one of which Peter promptly jumped into, ducking for cover. He didn’t wear a helmet, and he wasn’t carrying a weapon as he stared out at the world around him. His breath caught in his throat. His body went numb. Lord Almighty, where are you? The ground shook as bombs fell all around. One minute a soldier would be running for cover, and a bomb would fall just in front of him. When the smoke cleared, Peter found only a hole in the ground where the man had once been. Bodies were strewn everywhere, flying through the air with each deadly blast. Men cried in pain, desperate for help, while others were paralyzed with an overwhelming fear. From across the airfield, Peter could scarcely see the lone figure of a young airman standing rooted in plain sight. His mouth moved with unintelligible words—a prayer, maybe—and his eyes stared off into the distance, unblinking. Peter shouted for him to move, to take cover, but it was no use. Before Peter could even move, a nearby explosion swept the man away. Peter sank deep in the foxhole and dropped his face into his hands. The sounds, the sights, the smells were more than a budding officer could have imagined. Peter scurried up, dirt showering down on him. He tasted earth in his mouth as he peeked out, spying a tall man walking across the parade ground as if the battle wasn’t even happening. “General Wainwright?” he whispered, shocked. What’s he doing? But the man screamed at the top of his lungs, hot tears streaming down his face. Peter carefully heaved the man onto his shoulders, stood straight up, and headed toward an area where medics worked frantically to clear a spot for an ambulance. The air was hot, electrified, and pulsing with the fear of hundreds of soldiers. He gritted his teeth and pressed on. Lord Almighty, show me you’re here! “Lay him on this litter here!” a medic ordered Peter when he neared. Peter hunkered down, easing the man on his back onto the filthy litter. “You’re gonna be okay now,” he promised, but the look on the man’s face stopped Peter cold. He was dead. What happened to Dalton right before this scene? He finally kissed the nurse he has fallen in love with, promised to marry her, body surfed at dawn, stained lilies with iodine, and saved a redhead from a drunken lieutenant while dancing under a starry night sky to Count Bassie and Duke Ellington. Not all at once, of course. What happens to Dalton after this scene? Oh man. It's a mess...and gorgeous...and tearful...and inspiring. I think. What To Do With The Feels. All Of Them.